While on our trip in Ohio we found the Rockbridge State Nature Preserve. We enjoyed a great loop trail that was very birdy. The park is known for it's natural rock bridge or arch. The Wood Thrushes were everywhere, singing and just hopping along on the trail in front of us. We started off on this trail, which was next to this farm land. Very pretty location, we could hear the cows nearby mooing. It was hard to believe this trail was going to lead us to a natural bridge. We entered the woods, we saw and heard a lot of Wood Thrushes. 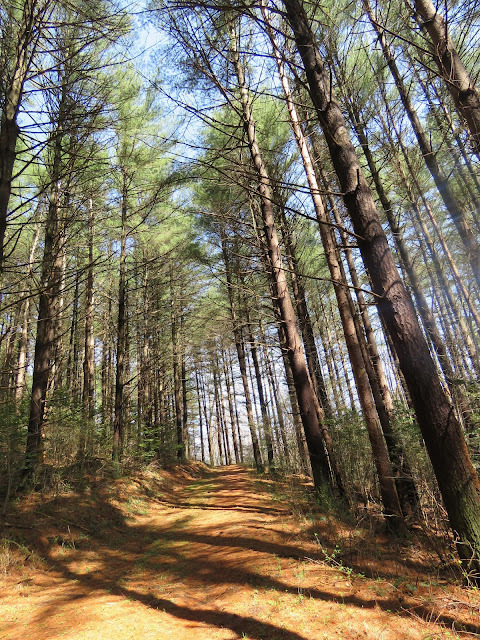 Birds seen in the forest and along the trail, Brown Thrasher, Wood Thrush, American Goldfinch, Scarlet Tanager, Common Yellowthroat Warbler, White-throated Sparrow and more Wood Thrushes. Some pretty wildflowers along the trail. Looking up from underneath a view of the natural bridge and a waterfall. A beautiful sky and the farm land, a view on our walk back to our car. A peek at the near by farm. I am thankful for all the park lands that are set aside and are kept as green spaces and all natural. I am thankful to be healthy to enjoy all these wonderful parks and trails for hiking. What a pretty walk - so different from the harsher Australian bush. Your birds are so different from ours, but just as colourful in their own way. I do like the look of the Brown Thrasher - I wonder how it got that name and the Weed Thrush. I am fond of those less obvious birds with their muted colours. ...yet another destination to put on my list. It looks like a lovely walk. I wouldn’t have. Expected to find a natural bridge along the trail either! Lucky you! It's been quite a while since I have seen “lots” of Wood Thrushes. I love “walking” with you . . .
Bird identification . . . back yard, Thrush . . . a Veery I am quite sure . . .
Added to my list . . .
Helloo, Loved the post. Awesome pics. Such a lovely place for a walk and for birdwatching! 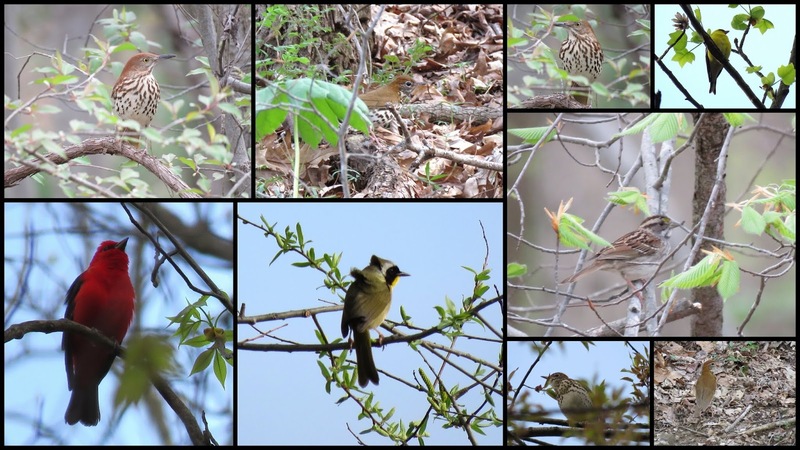 Lovely collage of those beautiful birds,i like especially the Wood Thrushes and the Scarlet Tanager! Excellent shots of the Natural Bridge,the wildflowers and the picture of the trees on the hill with the gorgeous sky,and the farm! Thank you for sharing! Wishing you a lovely day ! Thanks so much Liz, Tom and Linda, Rejane, David and Lynne, Yam and Rupam for your comments and visit. Dearest Eileen, these are incredibly beautiful. Hope you are well! Wishing you a beautiful day and weekend ahead! This is a beautiful place to walk and enjoy the wildlife and scenery. Have a blessed day. What a pretty place, and I bet you loved all those different birds. Great find! An awesome checklist of birds too! I really enjoyed that under the bridge look! Happy weekend. What blue and open skies! They gave me good feelings. Thanks for sharing. Beautiful photos. I love the natural bridge. Pretty wildflowers! This was a great walk, thank you for all the beautiful photos Eileen. "A walk in nature walks the soul back home." Loved the quote, it definitely speaks to me. Have a great day! Great walking place and what an interesting natural bridge. The rock bridge and falls are lovely! Some of my favorite photos ever. A beautiful place to visit. This looks like such an interesting park to visit, Eileen. Glad you are sharing all the wonderful nooks and crannies of it with us and all the different waterfalls and birds there. Your pictures are amazing. Thanks for sharing these. The natural bridge is amazing! Gorgeous place for a walk, and great photos along the way. Enjoy your weekend! Eileen, this looks like a perfect hike to me. I admire your bird identification abilities! I always enjoy the photos. Thanks for linking up today! You are so good allowing us to see and enjoy so much beauty and interesting places. I would never see them otherwise. This is such a interesting place, specially the natural bridge.. I've always wanted to go with you in those hikes, travels, trips! If only i am nearer! I love most that expanse so far that there are only a few trees at the side of the sky shot. You got some great pictures on your walk! You struck gold with birds, scenery and wildflowers! Wow. That's an amazing artifact in that landscape … I can see why the birds would like to hang around there - what a variety! Enjoy your weekend! Your walks are so impressive Eileen. I really love all the gorgeous scenery you've shown us... and that natural bridge - wow. The photo underneath it is particularly wonderful. To see the birdlife and wildflowers are a bonus too. Thanks for another great walk. Enjoyed all the shots. To see the birdlife and wildflowers was a pleasure to mee! Have a beautiful Summer and a Happy Friday! Wonderful Eileeen. I love these routes through nature. The beautiful photos. Ohhh...that's a pretty walkway and look at all those colorful birds. Fun natural bridge. Thanks for sharing your nature walks with us. Our country really has so much to offer. You to the most wonderful nature spots and do marvelous photography ~ love our feathered friends! So much beauty...I went back to the top and looked at everything again, but still can't decide on which photos are most comment-worthy. The natural bridge with the sweet little waterfall trying to carve holes in the rock, but we won't get to see that when it's done! I'm thankful that you take us along on your hikes, Eileen! Thanks William for the comments. Thanks to Mildred and Patricia! Thanks to Missy and Michelle, RedPat and Kay! Thanks to Bob, Carol and Ellen! Thanks to Carol, Laura and Ella! Thanks Sure, Angie and Linda W! Thanks, Amo, Krishna, LV, Angela, Andrea and Spare Parts! Such a lovely walk. I really enjoyed seeing your photographs.